I received this Olay Magnemask Hydrating Sheet Mask at the recent Glosscars Marketplace event. I liked that this mask is thicker than most other masks I've recently applied so I didn't have any fears about potentially ripping the mask as I was applying it like I do with the thinner tissue type sheet masks. There was ample serum on the mask and also leftover serum in the pouch that I used to apply to my neck and decolletage. The mask had flaps for placing over the eyes but I didn't use these as my eyes are super sensitive and I feel nervous having the serum over my eyelids. I left the mask on for 15 minutes as recommended. The mask stayed put for the duration of this time despite me moving around whilst it was on. Upon removal you are meant to massage your skin with the Olay magnetic infuser but as I didn't have one of these I massaged the serum into my skin with my fingers to help improve its absorption. My skin felt wonderfully nourished and hydrated afterwards. I would happily use more of these masks. Use fingers to massage your face afterwards if you don't have a magnetic infuser. Will be perfect to use during the dehydrating Winter season. My cheeks tend to get quite dry with dehydration lines and therefore I chose this hydrating mask at the Glosscars event. I have used quite a few sheet masks in the past and therefore know that they all have their advantages and disadvantages. However I have never used the Olay sheet masks and was very keen to see how this one goes. The sheet mask is slightly thicker and better quality than some of the thin "tissue" based ones I've tried and therefore the mask contains quite a lot of the hydrating serum. I applied the mask to my face and left it on for 20 minutes just so I could get maximum benefits. The serum absorbs pretty well, but did seem a bit heavy for my skin and there was still a fair bit remaining at the bottom of the packet, which I applied to my neck and chest. This mask definitely did leave my skin feeling more hydrated, smoother and drenched in moisture. I therefore think this is quick and fairly easy to use product when you need that extra hydra boost. It can be a bit messy to use, but I think the quality of these masks are better than a few I've tried, so I will consider repurchasing. The Olay Hydrating Sheet Mask is a mask made of a thick fabric and contained a serum that works to bring moisture to the skin. It has a fresh scent that is typical of many of Olays products, was easy to apply and remove. I used the mask to hydrate my skin before makeup application, it left only a slight residue which rapidly absorbed into the skin and left my skin looking smoother with my makeup applying well. The sheet material was thicker than many other masks I’ve used, so I was expecting that it could hold more serum and provide a pleasant experience. However, every time I moved my face the contact between the sheet and my face was broken, I kept having to smooth the mask back on. The thickness of the serum was enjoyable and seemed to be very hydrating but nothing that other similarly priced masks don’t offer. Because I was forever fiddling with the mask to get it to stay on properly I would be unlikely to repurchase. I had previously used the Olay Rejuvenating Sheet Mask so opted to try the Hydrating one. These sheet masks are so easy to use, They are thicker than most so you don’t have to be as careful when unfolding them. There is plenty of serum on the mask and a little left in the foil pouch if you want to use it on your neck and hands. The mask is easy to fit (my face is small so plenty of excess) and it’s designed with splits around the edge making for a perfect fit. This one came with flaps over the eyes (which the rejuvenating one didn’t have) and I wasn’t sure if to use or not, but I can see it’s probably optional and as I was lying in bed watching tv, left the flaps up! I have used these while sitting up (ironing) but far more relaxing to lie down for the 15 minutes. I drifted off to sleep so it was left on for 30 minutes! After removing (lifts off easyily) my skin was quite sticky and tacky and I was able to massage most of it into the skin. I didn’t use anything else on my skin that night and woke up with lovely moisturized and soft skin. I don’t have the magnetic infuser that you use in conjunction with their mask so can’t comment on the effectiveness of using it with an infuser. There's a lot of masks on the market and these are more on the pricey side and I did purchase my pack of 5 rejuvenating mask when on a good special but I wouldnt purchase them at full price. Wait until you see them on Special and they're readily available at supermarkets and pharmacies. Olay Sheet Mask is the best! I have used many different type of sheet mask in the market since I’ve been a fans of it. Less messy product, no need to rinse and leave my skin looks better. This Olay mask was given at Glosscar marketplace recently and I’ve been loving it! (Lucky , Woolies is having 1/2 price sale after that, so I can stock up). The sheet I found is a bit thicker than other brand which is good and I prefer it, it stay firmly on my face, my skin feels softer and looks plumper after using this mask. It had slight scent which I don’t mind. The ingredient is as great as their moisturiser. Great mask, Olay, well done! Clean your face and if possible scrub as well, to open your pores so your skin can absorbs the mask ingredients. Any type of skin that needs a boost. I got this mask at the Glosscar awards and was pleasantly suprised with it, having never tried the Olay sheet mask offering. This is the first sheet mask I have tried that has more of a lotion feel. It smelt beautiful like all of Olay's offerings and absorbed nicely into my normal-dry skin. My mother also used one and she thought it a great addition to her night time routine. My skin felt less dry the next morning and was somewhat customisable as it has cuts in the fabric that allow you to fit it to your face better, giving it a 3D effect as opposed to a mask that is flat with no cuts that means the holes in the nose and mouth and eye area do not align. Love this product! Needed to open up the mask carefully so as not to tear it but once on it was a delight to sit back and let the mask to all the work. My skin felt just a little tacky after removing the mask then the residual infusion was absorbed leaving my skin nourished and the surface smooth..
Use when you have a chance to just sit for 15 minutes and enjoy it. Everyone - especially anyone with slightly dry skin. I received this at the Glosscars Marketplace 2019 and picked this Hydrating variant as my skin can always do with that! I did like the way the mask clung to the face really well and there is a generous amount of serum in this sachet so I could rub the excess serum/mask treatment all over the rest of my body. I do think it hydrated my skin somewhat on my face (and body!) and exfoliated my face before using this mask to help it sink in as best as possible. I also used my little ionising vibrating tool that is used to help a serum sink in better into the face. This serum mask is nice and gentle and does not irritate my skin at all so it could be useful for those with sensitive skin that need a light hydration treatment. The mask needs to be left on for 15 minutes before removing and it's easy to apply (unlike some other sheet masks I've tried). My skin did appear lightly hydrated after this treatment. Ideal for those needing a light hydration treatment at home. Was eager to try this mask out, all upon receiving this at the recent Glosscars Marketplace event last Saturday (as at the time of writing this.) I am not a raving fan, even though this mask did hydrate my skin. I enjoyed using the product, yet I would not want to part with my hard earned cash to buy it. Don't know why. There was an excessive amount of moisturiser on the mask (even though full absorption was definite), combined with a fair bit left in the pouch. For me, that was a bit of a turn off, even though Olay are known to be innovators. Follow the directions and leave for 15 minutes. Use a dab of micellar water before application. This is the first time I have tried Ola magnemasks, although I have been using Olay for years. The sheet mask is really a great hydrating and nourishing tool for getting that hydration back on your skin. The pack contains 5 masks individually packed and sealed. I have used many masks the best thing about this was the way it fits it does not fall off or keep slipping from your face. The mask has a soft floral smell not too strong for me. I left if for about 20 mins as I wanted to maximise the benefit of the mask. After removing the mask I felt like I should be letting the product stay on my face so it gets absorbed but it felt sticky so I just splashed water and pat dried it. The mask left my skin soft and subtle and definitely hydrated. The next day my skin felt less dry. I love masks of all descriptions (sheet, mud, clay and sleep masks, and eye and lip patches) so I was naturally drawn to the Olay Magnemask Hydrating Sheet Masks. These masks contain a high concentration of two strong anti-ageing ingredients - niacinamide (vitamin B3) and pentapeptide - to plump the skin and reduce fine lines and wrinkles. These masks come in a pack of 5, each contained within its own sachet. The masks are drenched in serum and the fragrance is delightful and quite calming. What I instantly loved about these masks was the fit. I’ve used masks that were a great fit and some that have slipped all over my face but the flexible material in these particular masks make them the perfect fit. All I had to do was position the mask in place and it didn’t budge. It was as though my face and the mask were one. The mask is quite cold when it is first applied but the coldness soon settles down. I tend to leave my masks on for longer than suggested so I went about my business for 30 minutes before removing the mask. I have dry, mature skin and I can honestly say this mask left my skin looking smooth and really hydrated. After I removed the mask I massaged the remaining serum into my skin concentrating on my neck where the mask didn’t reach. There is so much serum in the pack so it would be a crime not to use it all up. I left the serum to soak into my skin for a few hours before I applied my usual night time moisturiser and eye cream. The next morning my skin looked radiant, bright, plump and smooth and it felt so soft. I haven’t experienced any tingling while using the mask, or any redness or irritation afterwards. Make sure you use up all the serum in the pack. for anyone who wants to boost the hydration to their skin while being left with glowing, smooth skin. This sheet mask was very hydrating and nourishing. Olay isn’t usually a brand I would go for when it comes to sheet masks as I have my favourites already, however this one was lovely to use. Packaging was very simple and easy to take out of the pack. Some sheet masks are tricky to unfold and rio easily but this was very durable and held the serum/product well. It stayed on for about 20 mins and peeled of leaving a nice soft, hydrated complexion. Apply after a shower when your pores are open and face is fresh to allow product to be absorbed. All skin types and people new to masking and wanting to try and good quality product by a good skincare brand. Thanks BH and Olay for including me in this trial! The masks themselves come in a holographic gold square box which contains 5 individual masks. The hydrating masks come in a sleeve with the mask which is absolutely coated in what I assume is the same gel cream as in the jar version in this range. This was my first time using a sheet mask so it was a little uncomfortable getting it to work at first - I had trouble getting it to fit where it should and it felt like it was slipping around my mouth at times but overall was fine. Initially it felt a little itchy but again this could come down to not being used to sheet masks. The instructions say to leave for 15 minutes. The mask itself has a delicate jasmine/pear scent which was really lovely. Once the time is up, you simply remove it and then use the magnet from the jar starter kit to smooth over your skin. If there is remaining gel on your skin you can wipe it off or it will absorb after a minute so I let it sit. My skin felt so ridiculously smooth and hydrated afterwards - kinda like that feeling after you've had a shower after a long swim at the beach lol. Overall, I'd definitely recommend these and will be using them again for sure! Thank you BH for giving me the chance to trial this product! I used this face mask once a week over a month in conjunction with the Olay Magnemask Infusion Hydrating Jar Mask Starter Kit and have found that over the course of this month, there have been drastic improvements to the hydration levels of my skin. I typically have very dry skin in the winter that is slightly prone to flaking, which can be annoyingly obvious when I am applying foundation. After using this sheet mask regularly, my skin was no longer dry and instead became a lot smoother and softer, making me look more youthful. The mask is a nice size that is easy to place on the face, and had good staying power so that I was able to still get low impact physical activities done whilst it was on my face. The mask comes with a more than average amount of product so it will take about 30-45 minutes for the product to absorb onto your skin. If you buy the magnetic infuser, I do recommend using that to speed up the process. I would definitely buy this mask in the future as it made me feel there was a noticeable difference immediately after using it each time. Thanks BH for the opportunity to trial this product! I received one box of the sheet masks and used this alongside with jar mask, the sheet mask I used 1-2 times a week over the 30 day trial period. The box itself ia gold and 5 sheet masks are inside. The masks are kept separate by white sleeves. Opening the masks are extremely easy and can be torn open, no scissors were needed to open these. The mask also fit over my entire face and the eyes and mouth wholes fit perfectly without going into them, the mask comes with little flaps, so if desired they can be placed over the eyelids if you are really wanting some extra tlc. The sheet mask was different from other ones I have used that usually come with a clear, slimey gel. This mask came with a white creamy addition which clung well to the sheet and didn't drip anywhere. The sheet mask was easy to separate and placed on the face, best thing was that it clung extremely well once patted down. I find some masks you need to sit completely still otherwise they can move but this mask allowed me to move about the house if I needed to. The reccomended application time is 15 minutes, I usually left it on between 15-20. My skin type is dry and I found this mask helped my skin so much. It added much needed moisture and kept my skin soft and smooth all night, even waking up the next day with nice skin. A lot of sheet masks I have used give my skin a tight feeling but this sheet mask just dumped a whole lot of much needed love in. I also rubbed the product in circular motions after removing the mask to let it absorb it completely. 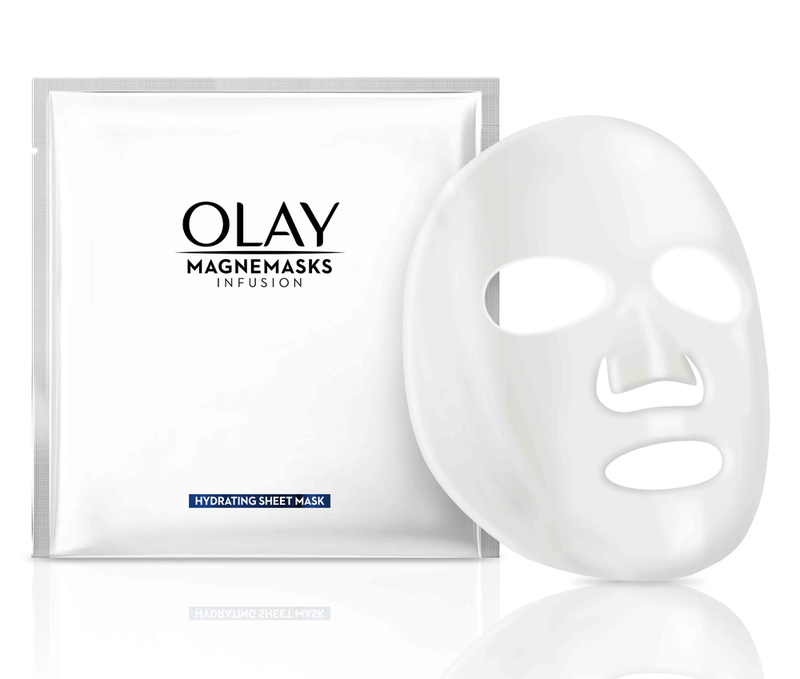 I was very excited for the opportunity to try these Olay Magnemask Infusion Hydrating Sheet Mask for Dryness & Roughness as I LOVE face masks in all forms and very curious about this one withe the magnetic infuser massager. The packet comes with 5 sheet mask, the mask was easy to use and fitted nicely on my face without gliding of my face. The individual packages was easy to open and generously with serum with a pleasant smell. I kept the mask on for 30-60 minutes, then massaged the leftover serum into my face, neck and décolletage with the magnetic infuser. I thought the serum was a bit rich for my normal skin type but I still loved the effect it left my skin feeling very hydrated and glowing but next time I will try Olay Magnemask Infusion Hydrating Sheet Mask for Rejuvenating, I think it will suit my skin better. If you have time, leave it on for longer then the recommended 15 minutes. I think this would be great for someone with a dryer skin type or winter time. I absolutely love anything sheet mask. When I've got one on, it's like 15 minutes to relax. Each box came with five individual sheet masks to be used in conjunction with the magnemask starter kit. The mask came out of the packet and had a LOT of product on it. I think it's great especially for dry skin that would drink it up. The mouth and eye holes were slightly small but it wasn't too bad. The mask definitely helped my skin with hydration, but I think the jar was probably better at doing this. I used the sheet mask once a week and it is a really nice way to relax. I was using the magnet on top of the sheet because I didn't read the instructions properly and I found this was nice as well. It left my skin a lot smoother and I put the packet into the fridge for 15 minutes before using it and I think this helped with my eye bags. I was lucky enough to be selected to trial Olays new Magnemask Hydrating Sheet Mask. Being a huge fan of Olay I was thrilled to trial this product though was left a little underwhelmed. I found this product to have a very pleasant smell which was not to overwhelming. And when applying there was alot of lotion and product on the mask itself. Though I found it to feel very thick and the serum itself didnt feel like it was hydrating enough for my skin. We were then directed to use the magnetic infuser in order to help absorb the excess lotion into the skin. Though this seemed like a unnecessary step in the process.  After using this product I didnt feel my skin felt anymore hydrated then before use. The product itself is fast absorbing though I am not sure it is all that effective. A little disappointing from Olay. Rubbing excess lotion in with your fingers work just as well. Thanks for giving me the chance to try and review this product. I don’t mind sheet masks so was excited to give this olay magnemask hydrating sheet mask a go. The pack needs to be purchased separately to the Olay magnemask starter kit- would be good if they were bundled together. The first thing I noticed was the fit of the mask. The mask does not fit very well at all- I had to cut it a bit to make it fit on my face and around my eyes properly. This is a definite downside! As for the product itself, I left the mask on for about 15mins until it dried up and felt firm. Once I relived it, my skin did feel instantly soft and supple. I didn’t see any long term improvement in my skin after using these masks though for a quick skin pick me up I think it is perfect! I was lucky to be selected for the trial team for this product. I am an advid lover of sheet masks, and my skin has been in dire need of hydration. The premise of this mask is that you apply the sheet, and when it's time to remove it, you massage the remaining essence in to your skin with the magnetic activator. The material of this mask is nice and thick, which I really like, as it stays on your face better, and there's no risk of it breaking as you unfold it. The scent is pleasant and not too overpowering, but it did feel a little bit irritating on my skin. I liked the idea of massaging the essence in to my skin with the magnetic activator, but it did not seem to absorb as nicely as the jar mask did. Unfortunately the three times I used this sheet mask, I woke up the following day with terribly sore, deep pimples, which is very unusual for me. I was not keen to use the remaining two sheet masks, and doubt that I will use them again, as obviously my skin does not like something in the mask. Strangely, I had no such reactions with the jar mask, and much prefer that to these sheet masks. Did our members rate these hydrating and rejuvenating formulas?